At least three people were shot dead on Friday as Kenyan police tried to disperse supporters of opposition leader Raila Odinga, AFP news agency reports. 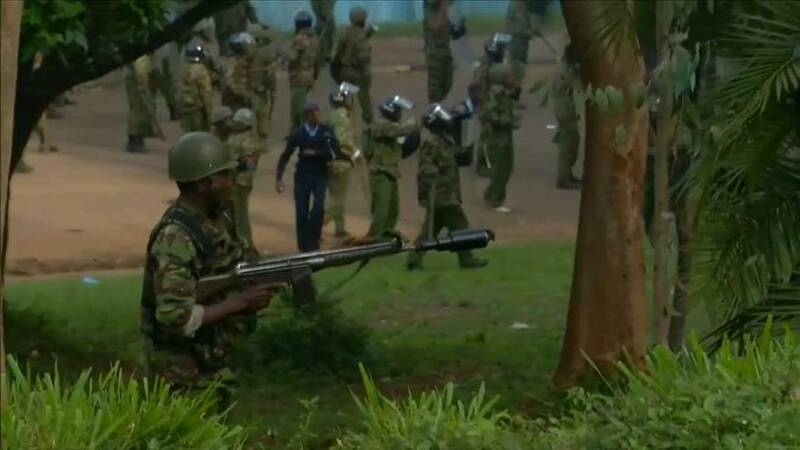 Police used tear gas and water cannon as crowds surrounded a convoy carrying Odinga from the airport to central Nairobi, live footage on Kenyan TV showed. Tensions run high ahead of a supreme Court ruling on Monday, on whether to uphold or nullify the reelection last month of President Uhuru Kenyatta. Supporters of his challenger Odinga want a new poll. Thousands of people had poured into the streets of the capital to welcome back Odinga, returning from a trip to the United States where he’s been seeking support. The deaths occurred as police and protesters clashed on one of the main roads leading to the capital’s business district. Police fired into the air to disperse them. Stones were hurled, and TV footage showed several vehicles on fire. Odinga has called for a “National Resistance Movement” to protest against the outcome of a repeat presidential election last month which saw President Uhuru Kenyatta win a second, five-year term with 98 percent of the vote after Odinga boycotted the contest. Only 39 percent of registered voters took part. In what is seen as the last chance for legal scrutiny of the vote, the court will rule on Monday on cases that seek to nullify the rerun election. Judges could order a fresh vote or clear the way for the incumbent to be sworn in for his second term. If the election is upheld, Kenyatta will be sworn in on Nov. 28. The opposition is pushing for an overhaul of Kenya’s electoral process. Human rights groups say at least 66 people have died in bloodshed surrounding the two elections.